George Bush fell off his mountain bike on Saturday, grazing his chin, upper lip, nose, both knees, and his right hand, a White House spokesman said. The president was 16 miles (26km) into a 17-mile ride on his ranch when he hit some loose soil while riding downhill. In addition to a military aide and Secret Service agent, Mr Bush was with his doctor, who treated him on the spot and has pronounced him "fine". 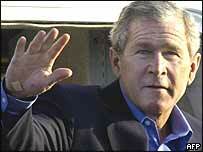 Mr Bush is due to give a prime-time speech on Iraq on Monday. 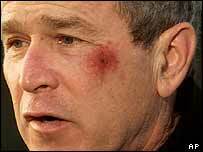 Mr Bush suffered "minor abrasions and scratches" during the fall, Trent Duffy told reporters. He was wearing a bike helmet and mouth guard, he said. "It's been raining a lot and the topsoil is loose," Mr Duffy said. "You know this president. He likes to go all out. Suffice it to say he wasn't whistling show tunes." Mr Duffy added that the president had refused an offer to drive back to the house, and had cycled home. Mr Bush was due to attend a graduation party on Saturday night for Jenna, one of his 22-year-old twin daughters. On Monday he is scheduled to give a televised prime-time speech explaining America's "clear strategy" in Iraq in the face of continuing violence and shocking revelations of abuse by American soldiers. The speech will be directed not only at Americans but a "global audience", the White House has said. It is not the president's first accident. In January 2002, he grazed his cheek after choking on a pretzel and fainting. And in June 2003, he fell off his hi-tech Segway scooter.